How to catch the longitudinal and transverse strings? How to quickly warm up your muscles? How to learn to use a banner? How to develop a softness and flexibility? How to avoid injuries and stretch marks? How to throw batmans and what turnout? Beautiful lines, the full sense of the body, its softness, freedom and range of motion, as well as professional equipment, the correct position of classical and discontinuous jumps, batman and jete. All this is achieved by regular classes of stretching (Eng. - "Stretch") - a special set of exercises, important not only for classical, but also for contemporary dancers. In studios of stretching in Dance Centre Myway professional dancers will teach you to safely warm up, stretch and strengthen muscles, to understand and properly use your body, use it in the choreography, as well as develop your body. Regular stretching exercises help to develop your body, increase the freedom and range of motion, increase muscle endurance. How to properly and quickly stretch out for dancing? You can stretch can be daily, morning and evening groups in Dance Centre Myway on initial and advanced levels. 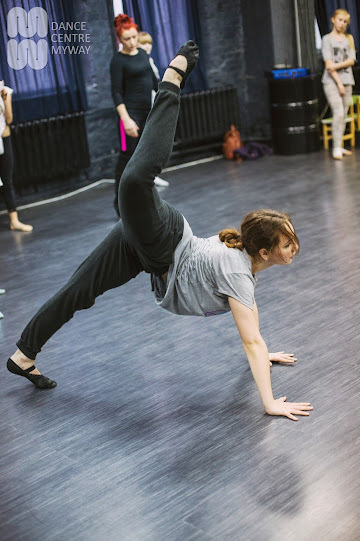 Classes are suitable for people of any age, with any physical training - both professional dancers, gymnasts and athletes and beginners - a teacher individually define the level of load and give advice on the further development. Stretching is also used as a rehabilitation program after injury. Classes are stretching muscles saturated with oxygen and nutrients, reduced muscle After heavy loads, prevent stretching of muscles, tendons and ligaments. What to wear with on stretching classes? On stretching better to come in free (and sometimes, on the contrary, emphasizes the body) doesn’t restricting movement clothes, without shoes, you can do it barefoot. Especially for dance, we have developed a line dancing hip-hop clothing Myway Dance Wear, which you can buy in our store.